The Russian Progress M-17M cargo spacecraft lifted off atop a Soyuz-U booster from the Baikonur Cosmodrome in Kazakhstan on Wednesday morning, on its way to an accelerated docking with the International Space Station (ISS) that was completed just six hours later. The launch marks the final delivery of cargo to be made to the ISS in the 2012 calendar year, apart from some small items aboard a Soyuz spacecraft in December. Progress M-17M/49P – also known by its NASA designation of 49P – launched on time at 7:41 AM GMT from its launch pad at the Baikonur Cosmodrome in Kazakhstan, carrying with it approximately 2.5 tons of provisions for the ISS Expedition 33 crew. Instead of performing the usual two day rendezvous profile however, Progress M-17M instead performed an accelerated six hour (four orbit) rendezvous profile – the same type of maneuver that was successfully demonstrated on the Progress M-16M/48P mission in August. With Wednesday’s fast rendezvous successful, sources note that it could be performed using a manned Soyuz spacecraft as soon as the Soyuz TMA-08M flight, which is currently scheduled to launch on March 28, 2013. Docking of Progress M-17M to the ISS at the Service Module (SM) “Zvezda” Aft port was slightly aheaqd of schedule at 1:33 PM GMT, with follow-on activities including hatch opening, deactivation of the vehicle, and critical cargo transfers to be performed later in the day. Should the fast rendezvous profile fail for any reason, the option will still exist to fall back to the standard two day rendezvous, which would mean a docking on November 2. Progress M-17M marks the first Progress docking to the SM Aft port to occur in the post-Shuttle era, since the previous Progress docking to SM Aft was Progress M-11M on June 23, 2011, prior to the final Space Shuttle flight. As Progress M-11M departed the SM Aft port on August 23, 2011, this unusual gap between Progress dockings to SM Aft was caused by the August 24, 2011 launch failure of Progress M-12M, which led to the SM Aft port being left unoccupied for six months, until the docking of Europe’s ATV-3 spacecraft to that port on March 28 this year. 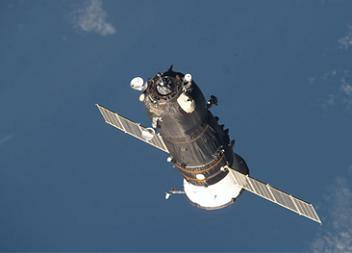 After six months at the ISS, ATV-3 departed SM Aft on September 29, and since then the SM Aft port has remained open. With Progress M-17M at SM Aft, the responsibility for ISS reboost burns will be handed over from the two SM main engines, to Progress M-17M’s engine. However, before Progress M-17M gets a chance to reboost the ISS, Progress M-16M, docked to Docking Compartment-1 (DC-1) “Pirs” on the Nadir side of the ISS, may get to perform that role, since ISS flight controllers are currently tracking a potential conjunction between the ISS and a piece of debris, which could require the ISS to boost itself out of harm’s way. The debris, catalogued as object 34533, which is a piece of Iridium 33 satellite debris, is currently predicted to make six close approaches to the ISS over the next two days, however getting an exact fix on the debris is difficult due to its low size and high drag properties. 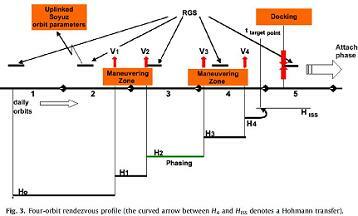 In case however the Probability of Collision (PC) violates the strict safety limits for debris miss distances from the ISS, NASA and Russian flight controllers are evaluating the need to perform a Debris Avoidance Maneuver (DAM) burn, in order to move the ISS out of the way of the debris’ earliest Time of Closest Approach (TCA) to the station, which is currently projected to be on November 1 at 1:20 AM GMT. If required, the DAM, which would be performed using the midring thrusters of Progress M-16M, for a burn time of 7 minutes, resulting in a delta-V (change in velocity) of 0.5 meters per second, would occur on October 31 at 10:58 PM GMT – about five hours after the docking of Progress M-17M to SM Aft. The burn, if required, would not affect the US spacewalk planned for the following day however.